In 2017, the Discovery Farms Programs in Wisconsin and Minnesota began monitoring water quality from tile drains. With 24 sites in each state, the goal of this extensive project is to find ways to reduce sediment and nutrient loss to tile drains, as well as determine if there is a relationship between soil health and tile water quality. This project would not be possible without the cooperation of excellent farmer participants. Here are two of their stories and reasons why they are involved in Discovery Farms tile monitoring. I am Roger Toquam. I farm with my wife, our three sons and our three daughters-in-law. Together we operate a corn and soybean farm in Dodge County, Minnesota. My sons represent the fifth generation of Toquams to farm this land. Our farm was honored to receive the Dodge County Conservation award for outstanding conservationists and also was recently certified by the MAWQCP (Minnesota Agricultural Water Quality Certification Program) from the Minnesota Department of Agriculture. We have always had livestock on our farm; my grandfather milked cows and my father had a farrow-to-finish hog operation. We now custom finish roughly 10,000 hogs a year for a family-owned Minnesota integrator. The manure from our two hog finishing barns along with the manure we purchase from three other hog farms is used as a fertilizer source, which lowers our overall fertilizer costs and improves our corn and soybean yields. Soil conservation has always been important to our family; my grandfather Clifford was a charter board member of the local county Soil & Water Conservation District, and my father quit full width tillage in 1979 and switched to ridge till, which we still implement today. The soils on our farm are heavy and black and do not naturally drain very well. In order for our farm to reach its full potential, our land was pattern tiled with wheel machines and most recently tile plows were used. Tile is an essential part of why the land in my part of the world is as productive as it is. My goal with being a part of the Discovery Farm tile monitoring project is to continue to learn as much as we can about our soils and how our farming practices effect any nutrients or sediment that may be discharged from the tile. Tile is critical to us and so is clean water, so we are excited about learning what we can. I’m Richard Olson of Olson Family Farms. 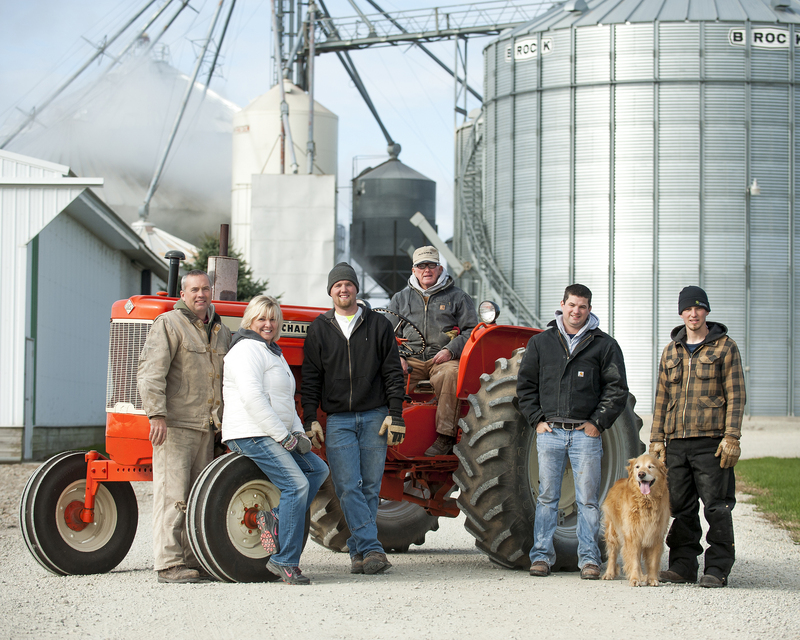 Our farm is a fifth generation dairy/crop farm located in southern Door County, Wisconsin. It is operated by myself, my brother, Eric, and Eric’s wife, Julaine. The farm is home to 155 registered Holsteins. 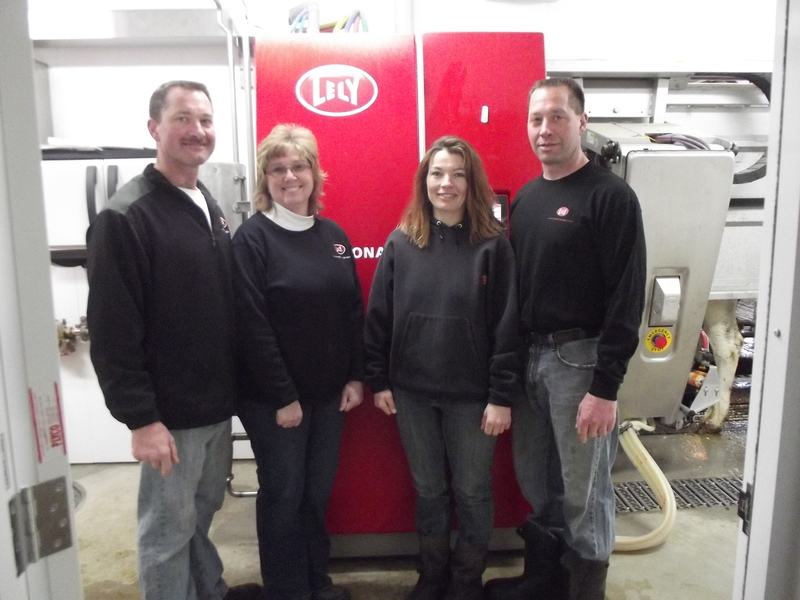 We have milked 60 cows, utilizing robot milking technology, since December 2013. Prior to that, we milked 100 cows in a tie-stall barn. Realizing that the rest of our farm was built to accommodate 100 cows, it would have been necessary to change many other aspects to go to two robots and milk 120 cows. Downsizing just made sense for us. Besides milking cows, we crop 1,050 acres. We grow alfalfa, corn, winter wheat, green beans, and red beets. We are fortunate to be in a part of Door County that has deep soil and benefits from having drainage tile in place. One unique aspect of the farm is that it is near Lake Michigan, and it is often ten degrees cooler than inland areas. The cows really appreciate it in summer. However, it makes baling dry hay a challenge. We are participating in the Discovery Farms tile monitoring project for two reasons. First, to learn and understand what is coming out of the tile in the way of nutrient loss and water quality. We have always felt tiling has been a great benefit to being able to get on the land sooner in spring and after rains, as well as eliminating wet spots in fields. Secondly, if there is a better way of applying nutrients to prevent losses and improve water quality, we want to use it. By having the opportunity to see the results on our own land we will know what can be achieved. Although there are no certainties, it is the hope that a next generation will join and continue at Olson Family Farms. My wife Shelly and I have two children, Matt and Claire. At this point they have other career interests. Eric and Julaine’s three children, Zach, Luke and Anna, will all be in high school this fall. Our farm is not expansion-minded; rather, we pride ourselves in doing the best quality of farming at our present size.